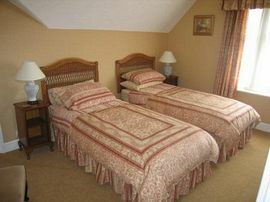 Thornhill Lodge is a charming guest house with a friendly atmosphere. 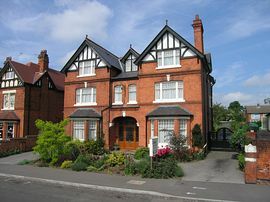 The elegant late 19th century house offers business and leisure guests a peaceful and relaxing stay. 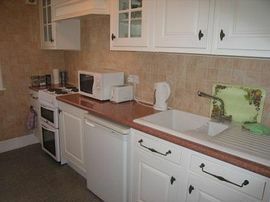 It lies approximately one mile from Derby city centre in a quiet residential area. An extensive refurbishment programme has recently been completed and now provides nine spacious rooms, individually styled to a high standard. The newly fitted luxury en-suite bathrooms are equipped with quality bathrobes, towels and toiletries. 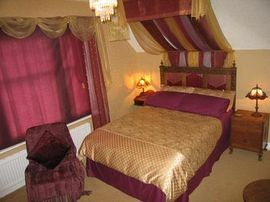 All rooms have a colour television, DVD/CD player, radio alarm clocks hair dryers and tea and coffee making facilities. High speed internet access is available. Choose from a hearty Derbyshire breakfast made with fresh local produce where possible, or a lighter continental breakfast, served in our sunny breakfast room. We are pleased to try to meet any special dietary requirements. One of the special features of Thornhill Lodge is our fully equipped kitchen exclusively for guests use. If you have had a tiring day, you may enjoy a cosy evening in. You can cook yourself a meal (large supermarket five minutes walk), and curl up with a good book or film from the DVD library. There is a choice of pubs and restaurants just a few minutes walk away. Easy access to public transport also means you can leave your car in the private car park and head into the city for a wide choice of restaurants, cinemas or theatres. Thornhill Lodge is conveniently placed for easy access to major routes; M1, A38 and A50. We are ideally situated for visiting Royal Crown Derby and Denby Potteries. There are many historic houses nearby such as Kedleston Hall, Calke Abbey and Chatsworth House. England's first public park, Derby Arboretum, is in the vicinity. For visitors interested in literary greats the homes of Lord Byron, DH Lawrence and Dr Johnson are all a short drive away. Derbyshire Peak District is easily accessible for an energetic hike, gentle ramble or leisurely drive in beautiful countryside. For excitement try Donington Race Circuit and the Grand Prix Collection, or have a great day out at Alton Towers theme park. A warm welcome awaits you at this friendly non-smoking guest house. Single ensuite room: £39.00 including breakfast. 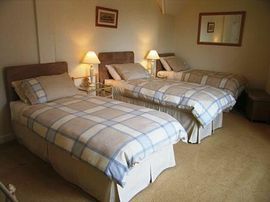 Twin ensuite room: £68.00 including breakfast. Double ensuite room: £68.00 including breakfast. Triple ensuite room: £94.00 including breakfast. "Extremely impressed...I've stayed in guest houses in England, Wales and Scotland - Thornhill is by far the best. Rea has thought of everything. I'll be recommending it to everyone. Many thanks for a wonderful experience." Andrea Goodwin, Sydney, Australia. "The ultimate in every way - could not be better!" Mrs Helmann, Saskatoon, Canada. "Thank you for your hospitality and attentiveness that has made our stay so comfortable and welcoming." Bill Rose, Saffron Walden, Essex. "Wonderful room - tasty breakfast. Appreciated the guest kitchen. Thanks." Kate Gold, Vermont, USA. Take 1st left onto Albany Road and 2nd right onto Thornhill Road. Take 1st right onto Trowells Lane (ignore dead end sign) and 2nd left onto Thornhill Road.